It’s a kind of open house. You come alone of with your friends or family. When you come in, you might like to meet some of the devotees. Maybe you’ll just wander around on your own and see what the place is all about. It’s up to you. The schedule differs from center to center. Generally things get started with some chanting of Hare Krsna. It’s a kind of meditation. The idea is to meditate on the sound. And if you decide to join along in the chanting too—well, so much the better. And if you feel like dancing in ecstasy, fine! You take it as you like, at your own pace, in your own way. After the chanting (it usually goes for twenty minutes or so) there’s a talk on Bhagavad-gita. 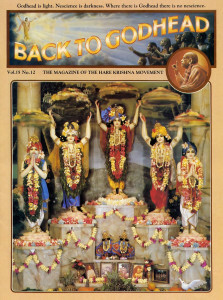 This is the basic book of spiritual knowledge the Hare Krsna devotees get their philosophy from. It’s five thousand years old, originally written in Sanskrit, and its ideas have drawn some of the deepest minds of the world. Emerson and Thoreau revered it. Albert Schweitzer found it fascinating. Mahatma Gandhi said it was the most important book in his life. If you haven’t read it yet, you’re in for quite a profound encounter. And of course you can ask the devotees questions about it too. In fact, the whole Bhagavad-gita comes to us in the form of a dialogue, and questions and answers have always provided the way to get at the essence of what the book is all about. After the talk about the Gita comes a ceremony called arati. If you’ve never been to a Hare Krsna temple before and you’ve never been to India, chances are you’ve never seen anything quite like it. Arati is an ancient and very beautiful ceremony that helps you come out into you spiritual identity, into a higher awareness, and ultimately into being reunited with Krsna—God—in a very personal way. In the arati ceremony, Krsna Himself appears on the temple’s altar in His Deity form (a statue, most people would say). A devotee offers Krsna flaming lamps of camphor and ghee, fragrant flowers, peacock fans, and a special white whisk call a camara. All this to the sounds of hand cymbals, drums, and the chanting of Hare Krsna. The effect of the ceremony is that you actually feel that you’re in the personal presence of Krsna—which in fact you are. (We’re all in Krsna’s presence all the time, without thinking about it, but the arati ceremony helps us realize it.) How it happens may be a little hard to explain. But when you attend the ceremony, the spiritual experience is very pure and natural. That’s why Krsna temples in India have held arati ceremonies every day since longer ago than anyone can remeber. After arati comes the feast. And it’s no small-time snack. 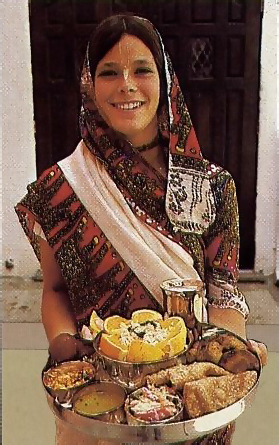 Devotees have spent all day—sometimes more—cooking wonderfully varied dishes, with devotion for Krsna. After the food is offered to Krsna (that’s part of what goes on with the arati), devotees and guests alike sit down to sumptuous plates. There are sweet things made with milk and grains and sugar that taste something like ice cream, cake, and smooth cream cheese all rolled into one. There are salty things, spicy things, fried things, baked things, blended things … People have been known to go on for hours later asking, “And what were those spicy yellow balls with the tomato sauce? And was that yogurt with soft little white cakes in it?” Other have just eaten and smiled big smiles. After the feast, maybe you pick up a copy of Bhagavad-gita to take home with you. And when you finally leave, you probably feel a whole lot richer within yourself than you did when the evening started.